Candidates for governor often face tough questions from their opponents and the press, but Thomas Loftus got stumped Tuesday by a third-grader at Johnson Elementary School. Loftus, the Democratic legislator challenging Republican Gov. Tommy Thompson, asked students if they could think of any difficult words he could spell. “Chrysanthemum,” chimed one student, referring to the flower. It appeared the Assembly speaker from Sun Prairie regretted ever asking. Several people in the room shook their heads, indicating Loftus’ version was wrong, but no one offered the correct spelling. For the record, it’s c-h-r-y-s-a-n-t-h-e-m-u-m.
Loftus, who was in Racine to discuss his plan to reform school financing and cut elementary class sizes, had some other interesting exchanges with the students. He asked kindergartners what the governor does. “He tells people stuff,” one boy offered. He then signed autographs for the students, which helped engrain his name in their minds. – This article originally appeared on Page 1 of the Racine Journal Times on June 6, 1990. View the original newspaper page. In the first half of the 20th century, druggists in America were often called on to literally fill prescriptions, placing medications into gelatin capsules and then counting out the order. Mauston pharmacist Carl F. Hanneman was very efficient at the task. Maybe too much so, opined The Mauston Star in a rather humorous article in December 1953. 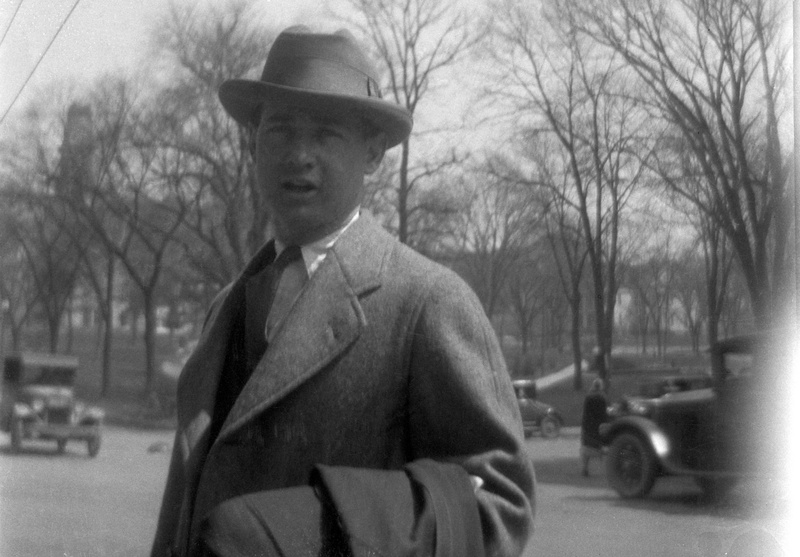 Carl F. Hanneman taking his suits to the cleaner at Janesville, Wis., on April 5, 1926. Carl and his wife, Ruby V. Hanneman, were on their way to dinner. Carl was a druggist at McCue & Buss Drug Co. at the time. He later moved to Mauston, Wis.
Carl was the registered pharmacist at the Mauston Drug Store on Division Street in Mauston. He had been the druggist there since moving his young family to Mauston in 1936 from Wisconsin Rapids. A graduate of Marquette University, Carl started as an assistant pharmacist, but obtained his full registered pharmacist license in the 1940s. 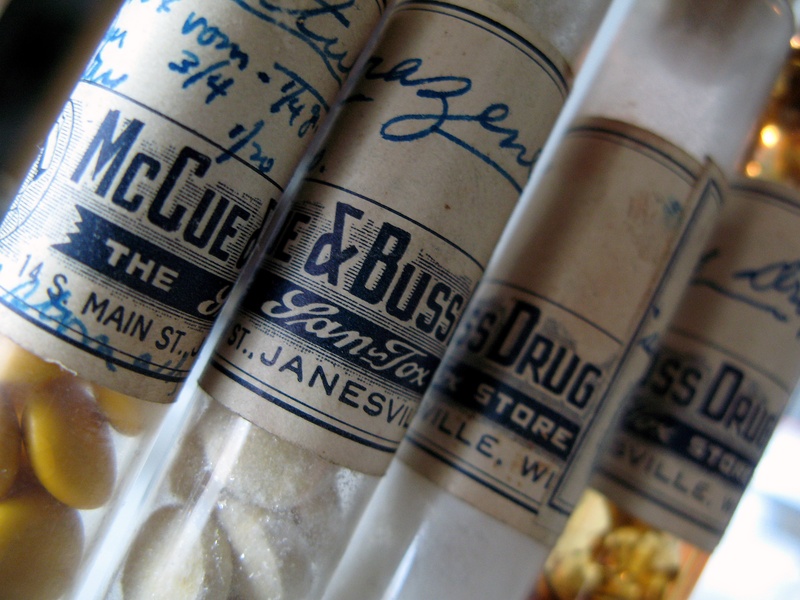 Judging by Carl F. Hanneman’s vials from McCue & Buss Drug Co., registered pharmacists packaged both pre-made pills and medicine capsules. The Volstead Act that ushered in the era of Prohibition was designed to prevent the manufacture, transportation and sale of alcohol in the United States. Don’t tell that to the cows. It seems some of the dairy cows belonging to Robert Hanneman of Portage County, Wisconsin, found themselves in a state of intoxication in July 1922. How? Some mischievous bootleggers thought it would be fun to leave a barrel of mash in the pasture for Hanneman’s cows to eat. When Hanneman arrived at the pasture one mid-July evening, he was shocked to discover a half-dozen hammered Holsteins. Wood County Undersheriff Cliff Bluett responded to the call. “The whole herd was staggering around and they were in a worse intoxicated condition than any human can get,” Bluett reported. Farmer Hanneman reported one cow was so dead drunk she could not be budged from the pasture. Five bombed bovines stumbled about the barn and had to be let loose. Eventually, most of the crapulous cattle submitted to the evening milking. That left the farmer with a serious quandary: would this unusual “whole milk” put him afoul of Prohibition laws? No word if those pioneer cow-tippers were ever caught. Undersheriff Bluett was from Wood County, but the Hanneman farm was in Portage County. He sent his findings to his counterparts across the county line. 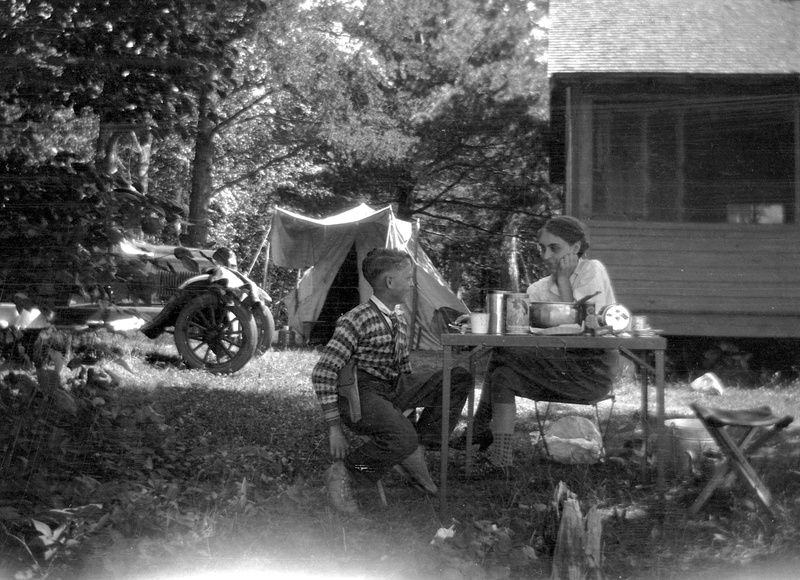 Many decades before the social phenomenon of taking self-portraits or “selfies” became all the rage, a young honeymooning couple in July 1925 predicted the trend by snapping their own photos at a camp site in Hayward, Wisconsin. Carl F. Hanneman and the former Ruby Viola Treutel were married on July 14, 1925 at St. James Catholic Church in tiny Vesper, Wisconsin. For their honeymoon, they chose to motor to Wisconsin’s North Woods. Part of their time was spent at a cottage owned by friends, Mr. and Mrs. Armand Bauer, in Hayward. 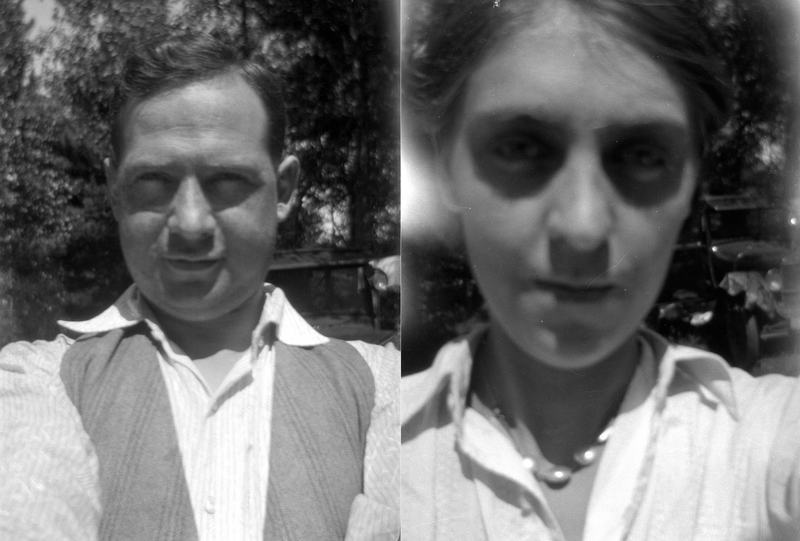 Carl F. and Ruby V. Hanneman took these selfies on their honeymoon in July 1925. Being a budding photographer, Carl took lots of photos from their trip, some candid and even playful. Two that stand out are ‘selfies’ taken by Carl and Ruby. Carl’s is at a good distance and quite sharp, while Ruby’s was an ultra-closeup, a bit out of focus. Given the camera technology of the day, these photos were more of a feat than it might seem. Nothing like snapping a quick shot today with an iPhone 6. 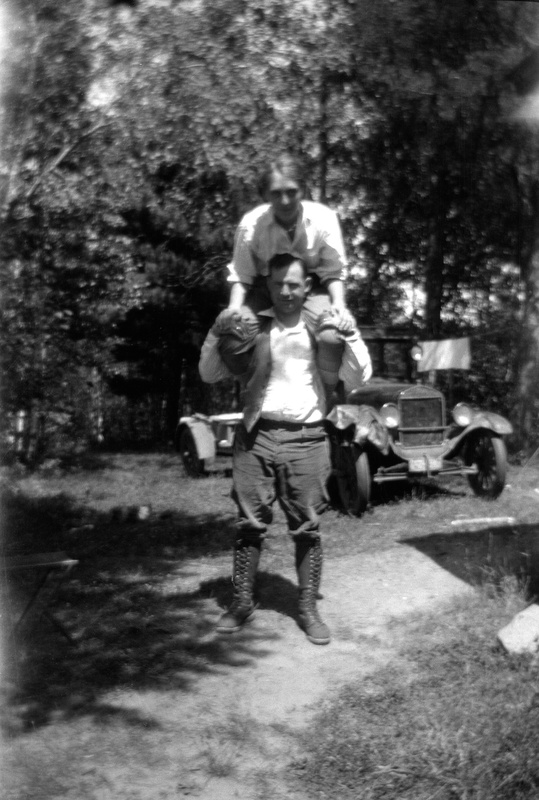 Ruby V. Hanneman rides on the shoulders of new husband Carl at their honeymoon camp at Hayward, Wisconsin. Other photos from the trip showed Carl walking with Ruby on his shoulders, Carl slinging a pail and Ruby sitting at a picnic table with a youngster who resembles her younger brother, Marvin Treutel (but might have been their hosts’ boy). 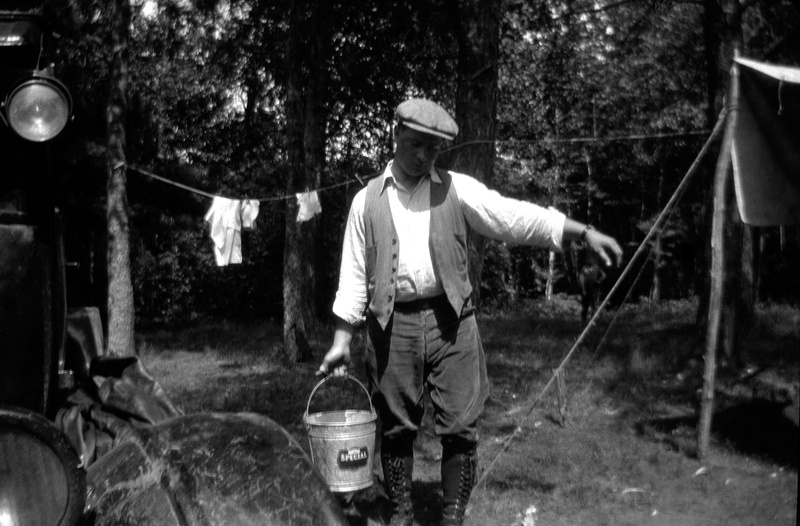 He could be carrying milk from the barn, but Carl F. Hanneman (1901-1982) is actually on a honeymoon camping trip in this July 1925 photo. 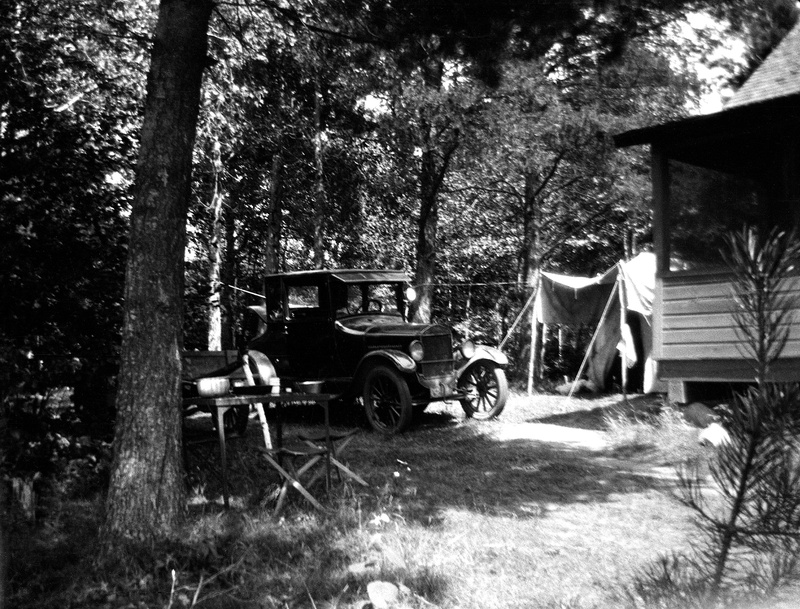 Camp scene from near Hayward, Wis. in July 1925. Pictured is the Ford Model T belonging to Carl F. Hanneman (1901-1982) of Wisconsin Rapids, Wis. Hanneman was on his honeymoon with Ruby V. (Treutel) Hanneman (1904-1977) of Vesper, Wis.
Carl and Ruby had no way to know that the ‘selfie’ would become a dominant means of communication among young people around the world, or that the practice would spawn social media platforms, a television series, songs and videos on YouTube. It’s good to be a trend-setter.